The campaign narrative focused on the objective of helping families reach their dreams. I highlighted the common goals parents have of feeding their children adequately and sending them to school, along with the contrast of how much harder that is for a family in poverty. Storytelling focused primarily on families who have overcome poverty, serving as a reminder that such a change is possible. The Plant With Purpose website was redesigned to make giving to the campaign as easy as possible. Links at the bottom of the page led towards more information about how donations would be put to use. I managed the Plant With Purpose social media channels throughout the day, providing immediate updates as funds came in. Four emails were planned for the campaign over the span of three days. While this was an unusual volume of emails for Plant With Purpose to send in such a small window, they acknowledged the uniqueness of the campaign and provided exciting updates throughout the course of the event. A Thank You email, recapping the event was sent out the day after. 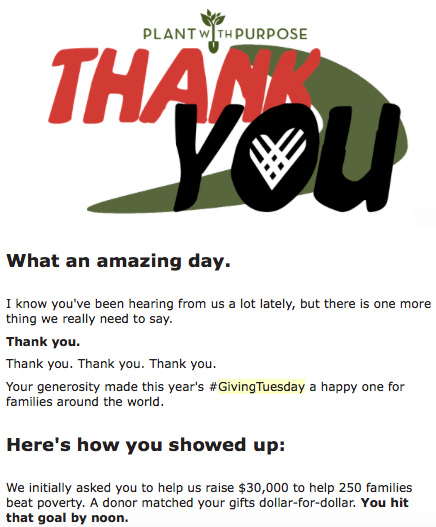 An immediate thank you email is uncommon following a Giving Tuesday campaign, as many organizations avoid exhausting their mailing list. Many Plant With Purpose supporters responded enthusiastically however, replying with their congratulations.